Dr. M. Sohail Yaqub M.D. M. Sohail Yaqub, MD, is an associate professor of clinical medicine at the Indiana University School of Medicine and a transplant nephrologist at Indiana University Health. 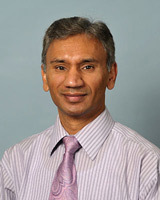 He completed his nephrology fellowship at Indiana University School of Medicine. His research interests include anemia in transplantation, BK virus nephropathy and weight gain. Dr. Yaqub's clinical interests include caring for kidney and pancreas transplant patients, high risk evaluation of transplant recipients and donor evaluation.